The QESST Student-led Pilot Line provides students at all levels with direct experience in fabrication and full manufacturing process flows for photovoltaic technologies. This testbed is an essential tool in supporting both research and industry engagement, as it allows practical assessment of the impact of a new process or concept for both students and industry. The largest pilot line effort (mirroring the industry focus on silicon solar cells) is provided through the silicon pilot line at ASU, together with the module pilot line at Fraunhofer’s Center for Sustainable Energy Systems (cse.fraunhofer.org) at MIT. Students also have the opportunity to use the thin film pilot line at UD. More limited opportunities (because of additional safety training and the relatively longer time commitment needed for the operation of such machines) also exist for III-V concentrating solar cells. The pilot lines further provide the opportunity to integrate technological advances from the other Thrust areas (strategic plan levels) into an industry-relevant manufacturing fabrication process environment. 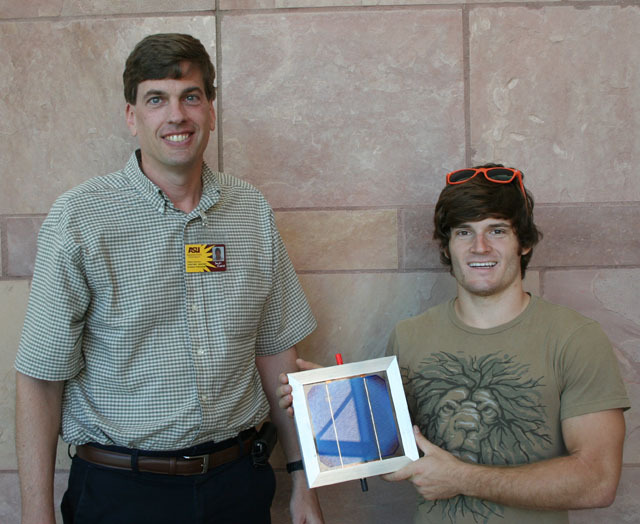 Bill Dauksher and James LeBeau show one of the first single cell modules to come from the student led pilot line. These modules are used in projects to explain photovoltaic concepts to K-12 and university students. Research Faculty: Stuart Bowden (lead-ASU), Mariana Bertoni (ASU), Tonio Buonassisi (MIT), Jeffrey Cotter (ASU), Zachary Holman (ASU), Christiana Honsberg (ASU), Robert Opila (UD). The long-term vision of this testbed is to develop self-contained integrated and smart PV modules that are part of the smart grid. Research in this testbed is thus geared towards developing integrated sensors, DC-DC converters and DC-AC integrated inverters and controllers that can achieve maximum power transfer from PV modules. The outcome of this research will result in improvements in efficiency, size, reliability, and cost of PV power generators. Within this testbed, a decentralized micro-inverter power management system has been designed, PV modules installed on an ASU building have been tested, and a power sensor suitable for use in a PV module has been implemented on a CMOS chip. Present activities are focused on advanced micro-inverter design and DC-DC converter fabrication. Research Faculty: Bertan Bakkaloglu (ASU), O. Lavrova (UNM), Jennifer Kitchen (ASU), Sayfe Kiaei (ASU). Testbed 3 is a pilot testbed started in Year 3 with the goal of developing tools that enable analysis of the impact of QESST approaches on the realization of TW scale PV. It is heavily focused on tying tools to the analysis of sustainability metrics to the technical goals for each of the Thrusts and Projects. Research Faculty: Christiana Honsberg (ASU), Tonio Buonassisi (MIT), Jeffrey Cotter (ASU), Stuart Bowden (ASU), Mathew Fraser (ASU).